YouTube videos are great but quite often we want the particular part of the video only. Yes, we need to take part of YouTube videos in order to remove the unwanted parts. This can be simple: if you are uploading a video to YouTube, YouTube provides the solution readily; but if you want to crop and download YouTube videos, it's a little bit tricky. Now never mind. Whether you want crop a YouTube video and save it, or clip YouTube videos for upload, this guide on how to cut YouTube videos will help. 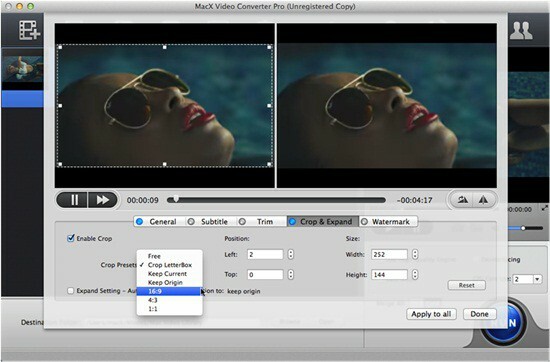 Whether you want to crop a YouTube video for upload, or cut youtube video and save offline, the professional YouTube video cutter MacX Video Converter Pro will satisify your needs by resizing a YouTube video to the aspect ratio of 16:9, 4:1, 1:1 other settings. YouTube editor is a web helper that comes with a few of simple editing features including a YouTube video cropper. With it, users can further customize the video to be uploaded with functions like trimming, adding music, special tools and effects etc. Step 1: Sign in your YouTube account and access YouTube Video Editor. 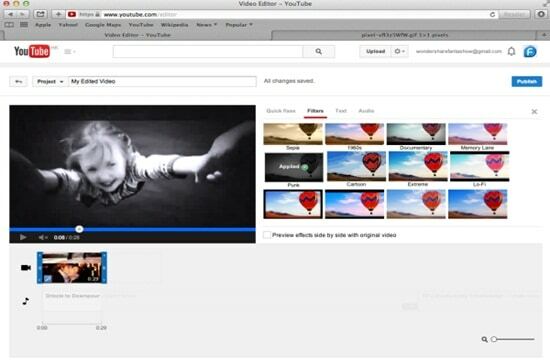 Step 2: To cut a video for YouTube, drag and drop the video into the video editing section. Step 3: Move your mouse over the video and click the scissors icon to start YouTube video cropping. Move this to the exact position where you want to clip the YouTube video, then click on the scissors button to decide the parts of YouTube videos. Click on Save. This will save your edit in the YouTube video editor. To upload to YouTube, click on the Publish button in the upper right hand corner of the editor. For your older uploaded YouTube videos, you can also use the formatting tags to further remove the unwanted parts from the YouTube videos. The formatting tag is especially useful when the aspect ratio is wrong or to remove the black bars around the 16:9 window. Step 1: Login and click the YouTube video manager. Click the edit icon on the video you want to cut. 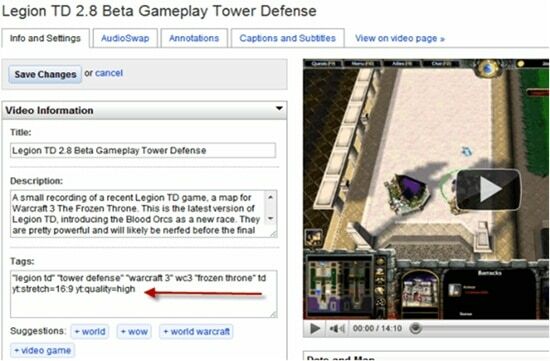 Step 2: Enter the formatting tag "yt:crop=16:9" into the Tags field below the video, and then click "Save Changes." Step 3: Click the "Video Manager" link to return to your list of uploaded videos. Click the thumbnail of the video you resized to view its new dimensions. Want to crop a YouTube video and save it for offline playback, or need more video aspect ratios for Instagram/Powerpoint other applications? The professional YouTube video cutting software MacX Video Converter Pro delivers the comprehensive solution. The software comes with a variety of useful YouTube video editing features which will cover the needs of users to adjust the YouTube video before upload or after download. 4. Crop a YouTube video and save it to various formats like MP4, 3GP, AVI, MOV, FLV, MKV more or directly to iPhone XS/XR/X/8/7/6S/6S Plus, iPad Pro/mini 4/Air 2, Android etc. 5. Besides, the YouTube video cropping software can not only clip YouTube videos, but also comes with various useful editing features to cut videos, add subtitles, merge, trim, adjust video settings etc. First of all, free download this YouTube video cropper on your computer. Note that it works seamlessly on the latest system of both Mac and PC (El Capitan/Windows 10 incl. ), so free download the Mac version or windows version based on your own needs. Step 1: For those who want to splice YouTube video and download it, we'll need to download the YouTube video first. Launch the software and click "YouTube" on the main interface. Click "Add Links" to and paste the URL of the YouTube video you'd like to crop and save. Step 2: After the video is detected, click "Auto add to convert list" to enter the format profile list and choose the output format or device and resolution. Step 4: Click Add to add the YouTube video just downloaded for further YouTube video cutting. Then click the scissor icon and enter to the video editing page. Click "Crop & Expand", check "Enable Crop" and start resizing YouTube videos as you like. Step 5: In the YouTube video editing interface, you can either adjust the cropping size manually by enter the exact width and height below the viewing window, or select either 16:9, 4:3, 1:1 aspect ratio for your device. Then click "Done" and the YouTube video cutter will automatically crop the YouTube video and save it. Then you can use it for Instagram/Powerpoint etc as you like.